The masses on facebook have been desperately wanting and waiting for a ‘dislike’ button. 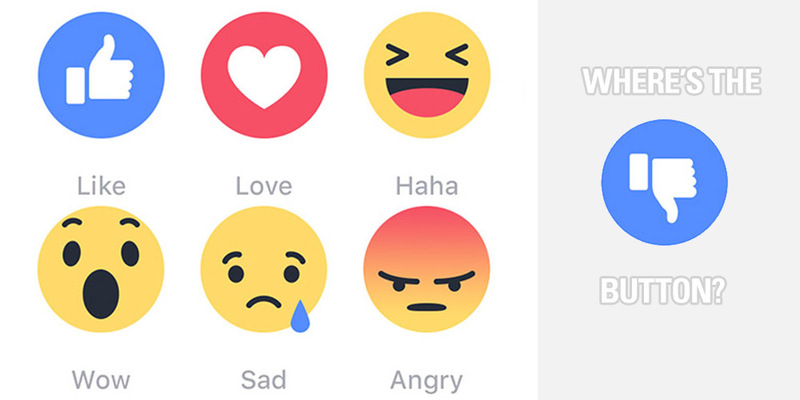 In return, facebook gave us some emojis (Love, Haha, Wow, Sad or Angry). But the ‘dislike’ button remains missing!! That makes us wonder, what is it with the ‘dislike’ button that facebook is giving a deaf ear to its user’s demand! Why Facebook Doesn’t Have DISLIKE Button. Though the like button had been helping us express our acceptance to somebody’s opinion or showing our happiness to somebody in their good times. But what about that facebook friend who spontaneously posts links to dumb quizzes and irreverent articles? You don’t want to show your anger to him by the emoji but you would want him to know that you aren’t liking it either. So a ‘dislike’ button would save your energy and time in such situations. After all, not all posts on facebook are positive and the user feels like giving straight away a thumbs-down to the post. Ignore the post entirely (this is the best and safest option!). 2. Comment on the post to formally record your disagreement. And it can open up a Pandora’s Box of pointless debate that could go on forever (Pheww…). 3. Just write an anti-post on your own facebook feed that expresses your point of view without directly engaging in any kind of debate (but somebody else can be in the mood to drag you into a never-ending debate by commenting on your post….danger!!). 4. Finally, you have the option of just removing that person from your friend list entirely (I wonder how many friends will be left in my friend-list!!). Before going to the reason for why facebook doesn’t have dislike button, let’s see how the ‘like’ button is more than beneficial to facebook and its users. 1. Even after the launch of the emojis, the like button continues to serve numerous purposes for Facebook and its users. 2. People are more inclined to “Like” a post than they are to punch a “Share” button. 3. The most obvious benefit of the like button for facebook is that it lowers the psychological barrier of connecting with commercial entities on the site resulting in higher engagement. 4. It increases clicks for web publishers and brands. 5. Results in more connections between people who share similar likes and interests, which creates more value for Facebook users. 6. Also, the like button helps the companies to target their audience along with details like relationship status, gender, location and education. 7. The like button influences the distribution of news, posts and opinions. Consequences of Facebook launching the ‘dislike’ button. The foremost reason that the company has given for it is that “It’s too negative and can have a lot of unfortunate and undesired consequences on users’ psychology.” Also, the Facebook mission is to make the world more open and connected whereas adding a ‘dislike’ button will create division among people. However, the real reason for not adding a dislike button is never divulged by the company. Interestingly Mark Zuckerberg on various platforms attempted to explain how something that’s clearly in his company’s own economic interest is actually in the interest of humankind at large. A ‘dislike’ button will lead to some tension between facebook, web publishers and brands. If users were given an option to dislike a brand that they find less appealing or had some bad experience with, the companies will gradually restrict themselves to advertise on facebook. Will the web publishers will be desperate to upload any content if they will have a hunch that the post may attract ‘dislike’ from its readers. I don’t think so! And all this will affect the revenue of the company. A “dislike” button on Facebook would discourage users from posting, liking, and sharing as freely as they might otherwise. If you see a lot of ‘dislikes’ on some post, then you might end up not reading it at all. It will be a barrier to engagement. Facebook trades in data about users’ behaviour, and more behaviour is almost always better!! Its algorithms optimizes for “engagement,” which includes uploading posts, likes, shares, clicks and comments. Thus it will hinder facebook’s growth. All these are justifiable business reasons for Facebook to keep denying the requests for a dislike button. But I am sure there can be ways around to deal with such situations (for example, the dislike option could be disabled on posts by brands, and there could be an option for users to disable the dislike button on particularly sensitive personal posts.) Also, on the contrary, facebook can utilise the like and dislike button on brands to prorate advertiser’s costs accordingly and generate money from it. We have been taught to open our mouth only if what we are going to say is more beautiful than silence. But in today’s free society, we will have to pay attention to criticism and negative feedback too. Because such checks and balances will help us all grow together and come to a common platform. Mark Zuckerberg, who is the most powerful force in web media, should be the last person to stall the ‘dislike’ button. Facebook has become the largest driver of traffic to news, opinion and voting sites around the Web. Its algorithms are more influential in determining what people see and read than any media on the planet!! Though we hope and wish to get the dislike option. But facebook has given no such indication and has no intention to launch it soon. So, now we have some insight into Why Facebook Doesn’t Have Dislike Button. So let’s wait for Mr. Zuckerberg’s green signal to our much waited and wanted ‘dislike’ button! !